Submitted by Justine Smith on April 4, 2018 @ 10:58am. If you were anything like me, as a teen your education was 5% school, and 95% Much Music. I knew all the VJs, I’d record the countdown on VHS and every Monday I’d exchange notes on the top of the week with friends at lunch. If any of that sounds familiar, you were probably a 90s child raised on a steady diet of Rap City and Nardwuar. You are also a dying breed, as the vibrant and groundbreaking artistry of the music video is on its last legs in Quebec and Canada. The music video industry was dealt two significant blows in Quebec in the past few years. Since 2013, Much Music and Musique Plus have significantly cut down on original content due to budget cuts. More recently, the CRTC no longer requires either channel to focus the majority of its airtime to music videos either. The two Canadian networks that once helped launch and sustain the careers of great artists are floundering, unable to compete with new media companies, like Vice and Youtube. For Canadian children of the 90s who grew up in front of Much Music and Musique Plus, the era of the music video as a fundamental pop cultural form seems to be long gone. Things only got worse in September 2017, when BellMedia killed their MuchFact program. While the name might not be familiar, they were the largest funding body for music videos in all of Canada. It was a program created in 1984 and in recent years has given out up to $2 million dollars a year in funding to bands and music video directors. While there still exists other funding agencies for music videos in Canada, such as the Foundation Assisting Canadian Talent on Recordings, the gap left by MuchFact is huge. In an industry that was already short on cash, this could easily be seen as the final blow against the music video in Quebec and Canada. In Chicoutimi at the Regard Short Film Festival, the health of the music video in Quebec was being evaluated. 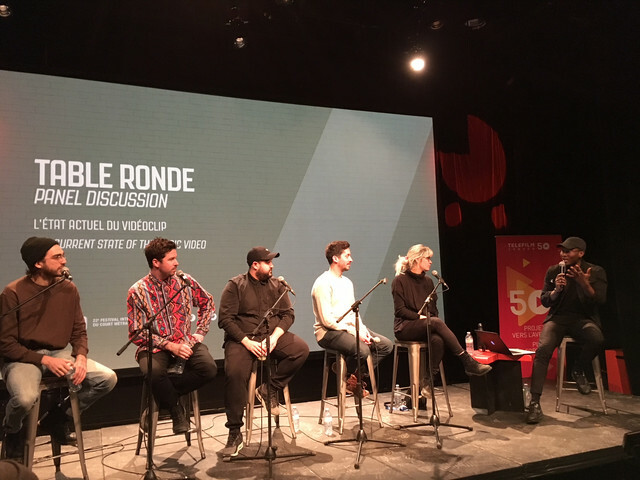 At a roundtable as part of their short film market, five music video directors from the province, Jérémy Comte, Laurence Morais Lagacé (aka Baz), Ariane Falardeau St-Amour, Daniel Abraham, and Pierre-Alexandre Girard, served on a panel to discuss the genre’s future in the province. The event was hosted by Nicolas Ouellet, popular radio host on La route des 20 on Radio Canada. The prognostic, unfortunately, was not good. Surprisingly though, the tone of the conference was not all gloom and doom. While the industry might be struggling, artistically the music video is thriving. You don’t have to look further than the talented panel of directors to see that there remains an incredible wealth of creativity and innovation within the province. Even for some of our biggest cinematic stars, the music video remains an important jump start and a continued source of inspiration. Denis Villeneuve, who recently directed Blade Runner 2049, got his start making music videos in the 90s, notably for Bundock Lanoie (such as Ne Me Dis Pas from 1994). And never one to follow convention, Xavier Dolan went from Cannes to Adele (well, with a brief stop to direct College Boy by Indochine) when he directed the now infamous video for Hello. While it takes years to put together a feature film and even a micro-budget usually entails over 100k, the music video is of the present. Especially on the lower scale of budgets, it gives an endless opportunity for experimentation that simply does not exist in any other commercial medium. Unsurprisingly, many of the directors on the panel toy with surrealism, shifting technologies and outright abstraction. Look no further than Baz, maybe the province’s greatest video innovator. He has worked for Outkast, Adidas and Hellman’s Mayo. Baz is also the director of Game of Death, a wacko gorefest comedy that won audience hearts at Fantasia and SXSW. His music videos are like Harmony Korine, Tim & Eric and Snapchat had an unholy child. Just take his video for Snare Drum for Alaclair Ensemble with Paul Desmarais. It opens with a chihuahua standing on four donuts, a cloudy pink windows background and a spinning logo with visible transparency in the background, flying penises, crosses, and pills. This is in the first ten seconds of the video. Throughout the video he blends computer graphics and screens, different kinds of camera and a rapid-fire editing that leaves you breathless. In another video for David Giguère, Aimer, Aimer, he has the artist (who is apparently Yeezy obsessed) into a time and space bursting computer graphic version of Kanye West. 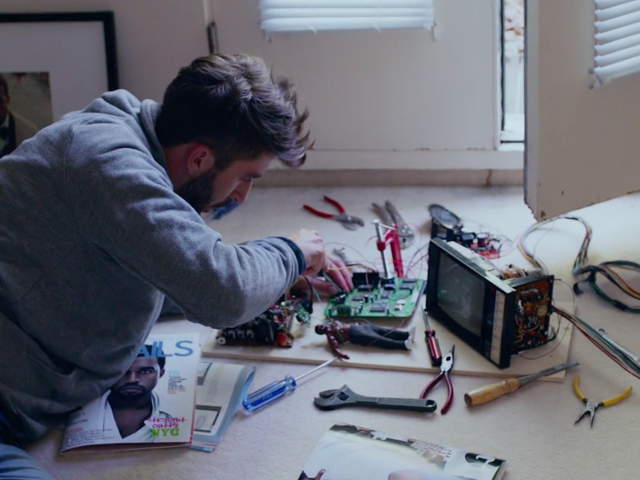 Jeremy Comte, who also won two awards at the festival for his short film Fauve, may reflect a bit more of a conventional side of the music video but nonetheless showcases the genre’s potential for mood and mystery in his video Sarah for Aliocha. His sleek polished style works beautifully with the mournful and romantic lyrics about longing and loss. With bright colours, shifting locales and identities, he captures the atmosphere of the song with polish and confidence.